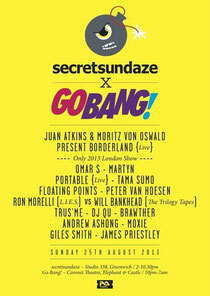 The secretsundaze x Go Bang! mini-festival on August Bank Holiday possibly embraces a broader musical vision than many other conventional house and techno events. Headlining is Juan Atkins & Moritz von Oswald present Borderland (live) – a project and collaboration from Detroit pioneer Juan Atkins and one of Germany's most important electronic producers, Moritz Von Oswald. Other artists include Omar S, possibly one of the freshest and most standout Detroit producer and DJs of recent years, and his uncompromising vision of house and techno, coupled with his undeniable confidence and swagger, has breathed new life into the genre. 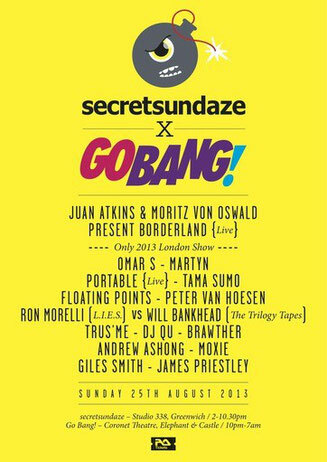 Martyn’s sound fits with the Go Bang! concept of cutting-edge dance music in the broadest sense, with his hybrid of house, techno, bass and breaks. Portable has a great presence, whilst Tama Sumo has a culture for great house and techno across the board. Floating Points is hard to categorise when he brings his take on house, techno and boogie together.